Stockwell 1983 by Gordon Wilkinson & Sarah Faulkner. Household?. Once upon a time they had a muralist in residence in Lambeth. And his name was Gordon Wilkinson. 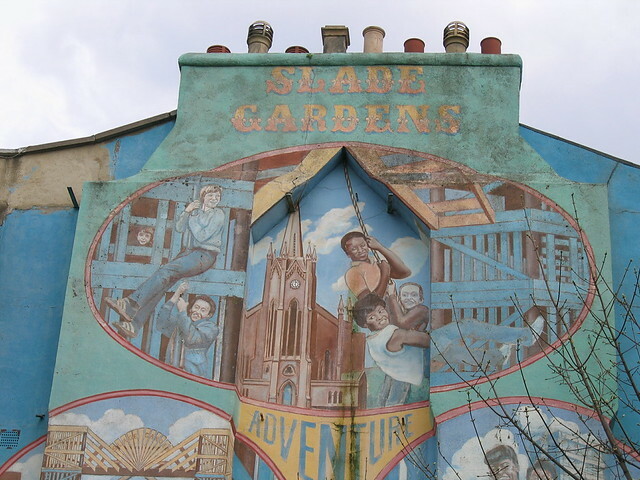 He was involved in a number of projects in the Brixton area but the only surviving work is the mural in the adventure playground at Slade Gardens. He painted this piece with his wife, Sarah Faulkner, back in the early 1980s. There are no newspaper articles archived about this piece so we are not sure about the date however the artists think that the mural was created and executed in 1983. The piece consists of several panels featuring a faithful representation of local residents, the adventure playground structure and the surrounding landscape. The people portrayed in the mural were some of the workers at the playground, the local policeman, the vicar of the church featured in the mural, a school dinner lady and her husband, and local children who used the facilities. Interestingly the people who ran the adventure playground ask not to feature in the mural. The playground now looks completely different as old structures have given way to new pieces so the mural also offers a chance to see what children were playing on in the 1980s. The landscape in the background is currently going through much transformation so this mural will be a brief moment in the ever changing world of London's Stockwell. The mural has suffered some damage due to a leaking pipe in 2010. Since this time there has been evidence of care for the mural so lets hope it stays there as a reminder of all the people who have enjoyed the playground. The mural is in fairly good condition however due to a overflowing water pipe, the piece has a recurring moss which grows where the water ran down the front of the mural. The painting has also faded over the years. From Stockwell Tube Station, cross Clapham Road, then cross Stockwell Road and head north up Clapham Road (passing the roundabout which has a mural painted on the top of a deep level shelter). Head down Clapham Road for five minutes and take the first right down Stockwell Park Road. Follow this road around until you can see the adventure playground. Take a left down Lorn Road and you will see the mural on the end wall.